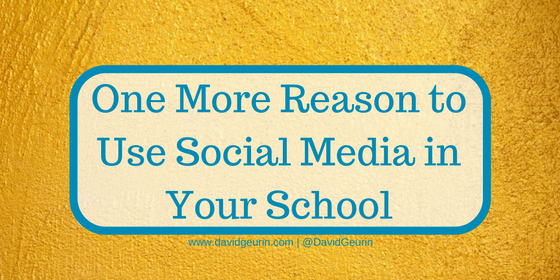 In an earlier post, I shared 7 Reasons To Use Social Media In Your School. The post outlines some of the biggest reasons to use social media as an educator. Never before have people been able to connect, share, and learn from one another the way we do now. Email is becoming less prevalent while social media platforms are becoming stronger even for professional communications. I've been thinking about one other reason to use social media, but before I get to that, I want to share 8 ideas your might want to try to incorporate social media into the life of your school. I included links to lots of examples and resources in this post. I hope you find them helpful. More and more schools are using Twitter or Facebook, and even Instagram and SnapChat to share positive moments and student successes. Social media is a great way to connect with your community and showcase the great things happening in your school. Social media can be a great way to share your monthly newsletter or an upcoming event, like parent open house or the school musical. Canva is a great tool to create social media images to use to promote different events. We've done this a handful of times, and it's been a fun thing to do. We just ask a responsible student if they would like to tweet out their day through the school account. We make some announcements leading up to it and give them some ideas of things to tweet about. It's a good way to encourage student voice and build trust with students. We did instructional rounds using Twitter to share out the great stuff happening in classrooms. Teachers were invited to visit other classrooms on their conference period. The idea was to tweet out the great things happening and really lift each other up and make learning visible. If a teacher preferred not to have visitors, they just posted a note outside of their classroom. Last year our Character Council partnered with several other CharacterPlus schools to do a social media campaign to promote kindness and acceptance. The students in the group wrote positive messages on sticky notes and placed them on every desk in the school. When students arrived at school, everyone had a positive message. Students were asked to tweet out the messages using #StartsWithUs. We had a couple of Twitter scavenger hunts, one for faculty and one for incoming freshmen. They are great team builders, but you can also use them to accomplish tasks in a fun way. For instance, one of the faculty challenges involved learning about different Twitter chats. Sometimes we use Twitter to give away prizes or play games during Spirit Week or any other time we want to spice things up. We had a mystery teacher game where we tweeted out clues about a teacher and students had to guess who it was. We haven't done this...yet. But we are planning something similar. Jennifer Hogan shared this idea on her blog. It's a great way to introduce newbies to Twitter and encourage teachers to use social media. It really looks like a lot of fun. For all the details, check out Jennifer's post: Kickstart your school's social media use with a Twitter party. The opportunities for using Twitter or other social media platforms are really endless. It's a great way to build community, generate school spirit, and promote creativity and whimsy. But I also wanted to share one more important reason to use social media with your students. I've been thinking about this a lot lately. I believe in sharing what students are learning on social media for this reason: I believe what students are learning is important enough to share with the world. It matters. Students deserve to have their learning celebrated. Tell your students the quality work they produce deserves to be shared beyond the school walls. It's a great message to emphasize that learning isn't just for the classroom. It should be shared widely. Question: What ways are you using social media in your classroom or school? I want to hear from you. Leave a comment below or respond on Facebook or Twitter.